CNC Vertical or Cup sanding Heads Designed to fit in the Collet of your existing CNC Toolholder. Applications range from Raised Panel Door Edge to the Sanding of Solid Wood Table Tops to Scuff and finish Sanding of various panels and materials. Sandpaper with available Grits 60, 80,100, 120, 150, 180, 220, 220, 240, 280, 320, 400, 600, 1000. 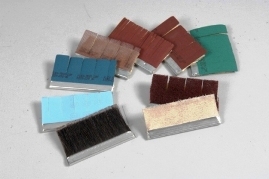 The Vertical Length of the sanding abrasive trim is available in: 30,40,50,60,780,75,80,100,120,140,200,250 and longer. S0040/45/120KE 6+9-180 grit ceramic paper with brush. S0040/45/150KE 6+9-150 grit ceramic paper with brush. S0040/45/180KE 6+9-180 grit ceramic paper with brush. S0060/30/100KE6 120 grit ceramic paper with brush. S0060/30/150KE6 120 grit ceramic paper with brush. S0060/30/150KE6 150 grit ceramic paper with brush. S0060/30/100KE6 180 grit ceramic paper with brush. S0060/30/220KE6 220 grit ceramic paper with brush.